← Soundarya Lahari – Shloka #55: Shridevi’s eyes are always open to protect the world! Japa Mala or mala beads has been used by our Great Masters from time immemorial. Traditionally, Master(Guru) gives the mala to his disciple along with a mantra to initiate him into a spiritual path. OK. Come along! Let us uncover the symbolism and significance of a mala and understand it clearly from a perspective of Sanatana Dharma(Traditional Hinduism). In Sanskrit language, mala or more correctly, maala means a garland of beads. Mala used for counting the affirmations or mantra repetitions in meditation is called japa mala or simply mala. The process of repeating a mantra or a phrase is called japa. In other words, 108 beads represent the entire universe. When we count the mantra using the mala, we are remembering the presence of the deity who is the Universal Self in every part of the universe. So, after each cycle of repetition, we cover the entire universe by feeling and touching the presence of deity of the mantra in it. 108 beads symbolize the universe and repetition on each reminds us the omnipresence of the Universal Self(a.k.a God)! It suggests the immanent nature of the Universal Self. Additional 109th bead is knotted to the mala. It is called by different names Sumeru, Meru bead, Guru bead etc. To show respect to the Master(Guru), Guru bead is never crossed when counting the mantras during meditation. Instead, the mala is turned around so that the next round of counting begins with the 108th bead. The Guru bead is separate from the main mala. As discussed earlier, main mala of 108 beads makes the universe. Since Guru bead is separate from the main mala(i.e. universe), it suggests that the Universal Self is transcendental, i.e. beyond the universe. The name of 109th bead is Guru bead. It is separate from the universe of 108 beads. It means that Guru is the force beyond the universe and is nothing but the Universal Self that directs everything. It means that Guru is nothing but God. The tassel after the Guru bead indicates the fourth state called Turiya. It is a transcendental state beyond three states, viz., waking, dream and deep sleep. The string of the mala symbolizes the Universal Self. How? Remember, we discussed that beads form the part of the universe. The string holds and supports the beads. So, it symbolizes the Universal Self which is the force that supports or sustains every part and every being of the universe. In a japa mala, 108 beads are strung in a circular fashion. It represents the cyclic nature of the universe, without an end or a beginning. The Universal Self is the only unchanging principle, just like a string in the mala. The circular arrangement also signifies infinite birth and death cycle. Actually, Individual Self also changes the bodies in an endless cycle. So, the highest goal of our lives is to permanently escape from this cycle by merging with the Universal Self. The beads are like different births or bodies. By contemplating the mantra of the deity continuously, we would like to access the inherent thread of the universe, the Universal Self, which is eternal and unchanging. Traditionally, a knot is kept between the beads to ensure that the beads won’t touch each other. This is to avoid the distraction that may be caused due to frictional sound of bead during mantra meditation. Knot signifies the divine link present between all beings of this universe. It reminds us that all of us are strung in the thread of the Universal Self like Sutre maniganaa iva, meaning the beads strung by a thread. What a great teaching, indeed! What kind of mala needs to be used for mantra chanting? To recap, the mala should have 108+1 beads strung in a traditional way with a knot between the beads, with a tassel at the end of the Guru bead. The color of the thread is normally yellow or orange. Sandalwood and Rudraksha beads can be used to chant on almost any deity. Using Sandalwood bead calms the mind and leaves a lingering pleasant aroma on the hand after meditation. The Rudraksha beads are the embodiment of Shiva and Shakti loaded with divine power that supports the meditation to merge with Shiva and Shakti, i.e. 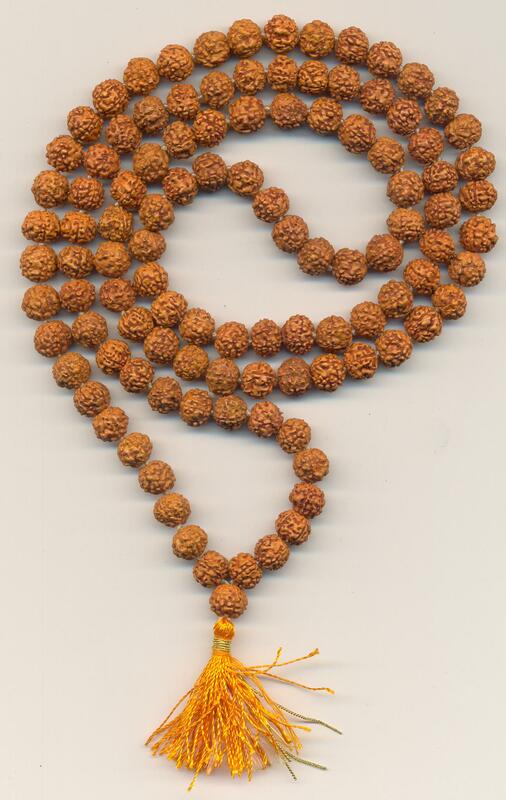 Rudraksha Yoga. Keep the index finger and thumb spread so that they are perpendicular to each other. Thus, index finger points away from you and thumb points up. Make a group of rest of the three fingers and bring them together to make them perpendicular to the index finger. The group of fingers point towards left. Place the mala on the middle finger while keeping the index finger pointing away from you. This is indicate and feel that our ego going away from us during chanting. Also, index finger symbolizes our ego. So, we need to ensure it does not touch any bead. In other words, we must park our ego separately during meditation. Start chanting the mantra from bead next to the Guru bead, i.e. starting bead is above the Guru bead so that the Guru bead is not crossed. Continue chanting the mantra for each bead till you reach the Guru bead. It is recommended to use specially shaped cloth bag called gomukhi(means ear of cow) to keep the mala while chanting. This ensures that mala is concealed so that others cannot see the mala while chanting. As per traditional experience, showing the mala to others reduces the energy acquired by chanting. Another advantage of gomukhi bag is that it naturally keeps the index finger separate outside. You can easily learn using the gomukhi from any experienced Master. Caution: The above instructions are just the guidelines for illustrative purpose only; not for experimentation. Kids! do not start chanting some mantra(especially Tantric mantras containing seed letters like Hrim, Kleem etc.) on the mala by reading books, without guidance. Improper practice may lead to undesirable psychological effects and may be potentially harmful. Your safety is important to us. So, we strongly suggest you to learn practical usage of mala from an experienced Master. Should I have to use mala for meditation always? Good question. Short answer is no. Remember, mala is a tool to help you focus in the process of connecting your Individual Self to the Universal Self via mantra. Once you get the required concentration and trick, you should(may) do away with the mala altogether! Here is why. Manual support and hand-holding is important when you are learning how to ride a bicycle or swimming safely. Once you get the balance and learn the trick, the same support hinders you from going faster comfortably! We hope you got the message. In any case, we strongly suggest you to follow the advice of your Master in this. May I wear the mala that is used for chanting? No. Not recommended. Spiritual energy is stored in the mala because of chanting. So, it is best to keep the mala at a clean high place or altar. According to our Masters, displaying or showing the mala to others reduces the stored energy. Use a different mala for wearing if your intention is to remember the divinity always. Conversely, do not use the mala used for wearing to chant mantras. May I exchange my mala with others? No. Do not do it. Because of chanting, a special bonding gets developed between you and your mala. As discussed, part of spiritual energy of your practice gets stored in the mala as well. Keep your meditation mala private to yourself. Do not share it with anybody, like a toy. Do not show off with others too, it is not a fashionable jewellery either. If you protect and respect the mala, it helps you in your spiritual progress for sure. How should I keep the mala? Traditionally, mala is kept inside a cloth bag and is placed on the altar or at a high sacred place to show our respect to power of deity that is accumulated by our meditation. Never drop/keep the mala on the floor for two reasons: 1. To show respect to the mala. 2. The spiritual energy gets reduced due to “earthing”, just like static electric charge. Adore the mala like your favorite deity and it takes care of you, just like God! If mala falls on the floor by accident, we need to purify and re-energize the mala as described in our Scriptures. Entire string of the mala is the Universal Self. The beads are like every one of us having a portion of the divine thread called Individual Self within us. The clear symbolism of the mala is that all the beings of this entire universe are strung together by the string of the Universal Self. So, we need to show the compassion to others including animals. We should not take away the right of living from sentient beings for the sake of satisfying the taste buds and filling the stomach. Let us eat pure vegetarian food to keep our body and mind free of diseases and bad karmas. Consider bead as our body with mind and thread inside the bead as the Individual Self. Entire thread of the mala is the Universal Self. So, the teaching of the mala is that every one of us has the part of the Universal Self, called Individual Self. One more thing: notice that the thread in the bead is not clearly visible in the mala, unless we move the bead. Likewise, we cannot feel our own divinity, Individual Self within us, unless we transcend our limited body and mind machinery. In other words, if we go beyond(or transcend) our body and mind, we can access the thread of the Universal Self. For it to happen, we need to get the Grace of a Sadguru and Shridevi to remove our ignorance to access the Highest Knowledge. By this, we can realize that part of thread of the Universal Self within ourselves. Meaning: Salutations to Her(Shridevi), who is the consciousness present in all being. Salutations to Her, Salutations to Her and Salutations to Her..(..always, again and again, forever..).. This entry was posted in Mantra Yoga, Meditation, Rudraksha and tagged about mala beads, how to use mala, how to use mala in meditation, importance of mala in meditation, japa meditation, mala beads, mala beads importance, mala beads meaning, mala beads meditation, mala beads symbolism, mala meditation, mantra meditation, mantra yoga, meaning of 108 beads in mala, rosary in meditation, significance of 108, significance of beads in mala, significance of mala, spiritual meaning of mala, spiritual significance of mala beads, using japa rosary, using mala in mantra meditation. Bookmark the permalink.